My 2000 Chevy Malibu was running rough while it was idling in park or at a stop light, stop sign, etc. I popped the hood when I got home and saw a vacuum that was disconnected. I connected it and the car stalled. I started it back up and it ran smoother. I disconnected it and repeated the process with the same results. I noticed where I connect the vacuum to it is slippery and appears to be oily. Should it be oily and any thoughts on making it stay on? What does this hose even go to? The link is to a picture. Thats your PCV line. That stands for positive crankcase ventilation. It pulls gases from the crankcase out and draws them through the intake into the engine where they are burned. It also holds a negative pressure on the crankcase which helps the piston rings seat better. If disconnected it allows unmetered air into the engine that the mass air sensor didn't read so the ecm doesn't know it is there. The oxygen sensors see the extra oxygen and tells the PCM that the engine is running lean, so it delivers more fuel. When you suddenly fixed that leak the ECM couldn't compensate right away for it and the engine stalled. The reason it ran better after restart is that the PCM was correcting its fuel trims to match the new data that the sensors were reporting. The oil is normal, but if the hose doesn't want to stay properly reconnected you'll need a new one. Nice pic. It helped me see exactly what was going on right away. Thanks for your help and detailed answer! Your help is much appreciated. Would those be something I pick up at autozone or a dealer? Was the PCV coming out of the grommet or the hose the issue? That shouldn't just pull out so easily but not the world either. You may need the grommet that the hose + PCV is going into. Tom raises a good point about checking the grommet out that holds this in. If its deteriorated replace it. Its cheap. Most any parts store should be able to get you all of this. There is a rubbery piece at the end of the hose that is at 90 degree angle and I believe that is sliding on to the PCV valve? I tried to find the part on Autozone's website that the hose is sliding on to, but I'm not sure if I got the right one. The hose and rubbery piece can lift off the PCV valve with little to no effort. The elbow is actually a spark plug boot that someone had stuck on there as a temp fix. A spark plug boot's rubber isn't compatible with the oil and tends to swell up and become gooey. Not sure if you can buy the elbow...haven't seen the aftermarket sell them yet. The dealer sells you the whole pipe to get the elbow. The grommet is available at local parts stores and can get the tube and elbow online. I would still check the dealership though. There have been a few times where their parts were actually cheaper than the local parts stores. It doesn't happen very often but it does happen. They do make packages of odd things or near obsolete stuff. Took me a while to find them at all on the web. Apparently "Motormite" has bought the product line if that helps? Other fix in the redneck grouping that works. If you need to make a right angle out of good hose meant for PCV use meaning it won't collapse under vacuum and should be fuel and oil tolerant you can just get perhaps a foot of it but good product shouldn't need that much. Now just make a curly Q out of straight hose and you can make that right angle. That is sort of like making a partial loop. Bulk hose should be marked what it can tolerate. If you just asked for automotive fuel injection line should be enough. Parts stores around me are getting away from selling anything that comes off a roll no doubt because a real human has to measure it to know how much to charge and can't just swipe a bar coded package. Nice progress world! Now watch out if you pull a trick till you can find the correct elbow. The make a loop still has to be out of the way of anything - perhaps even the hood when closed. That's a trick and have done that many times when time was of the essence with a vehicle running so poorly and couldn't wait over a long weekend or continue driving over something so silly but necessary. 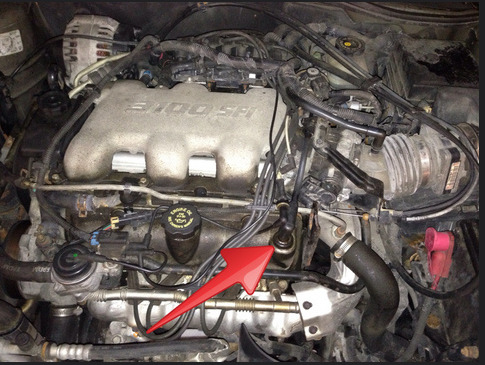 Not fixing it so it will last you risk other damage that will be caused by an engine not running properly.